Author Zoe Corbyn wearing Glass. Ripped off The Observer/Guardian. Zack Freedman, who lives in New Jersey, describes himself on Twitter as a “diehard Glasshole” (the name given to Glass devotees when they ignore the outside world). He builds electronics prototypes for a living and wore his own homemade wearable face computer before he got Glass in November 2013. He is the only person who tells me Glass is a little too sleek for his tastes. 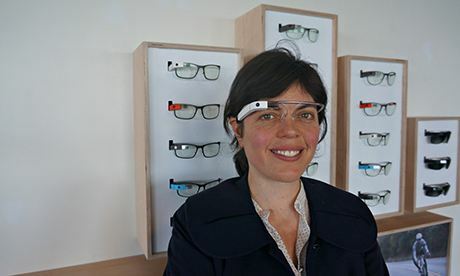 It’s great to see some Glass-related journalism that doesn’t focus exclusively on the camera. I highly recommend you read the article, it’s an excellent high-level overview of the complex battle raised by heads-up displays. Wearable tech raises complex social, moral, and technical issues, and I love seeing them get some critical treatment. Also, man, is it surreal to be mentioned by name alongside Doctors Starner and Bogost. Fun fact, Zoe found and contacted me because I had the phrase ‘diehard Glasshole’ in my Twitter bio. How’s that for consistent branding? This entry was posted in Myself by Yours Truly. Bookmark the permalink.